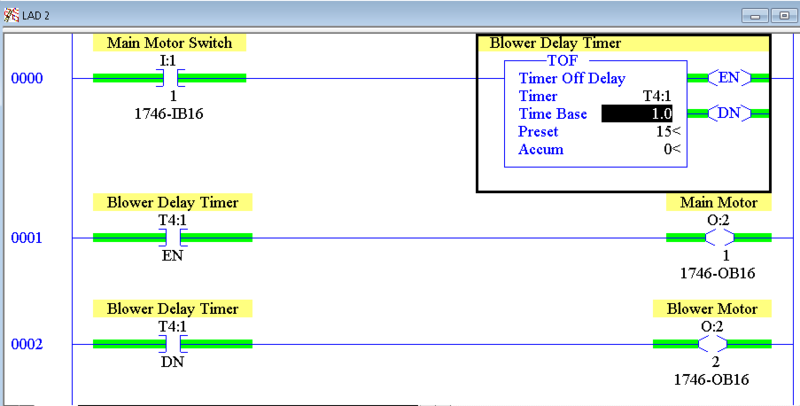 The SLC 500 Off Delay Timer (TOF) Delays the DN (Done) bit from shutting off. Many people will find this as the most confusing type of timer. Once you understand it’s operation, and relate it to a real process, however, its easy to use. Examples of an the SLC 500 Off Delay Timer include a blower on the top of a motor. The blower continues to keep the motor cool for a certain time after the main motor is shut off. Another example is a conveyor system. When you shut down a conveyor system, you shut off the product being fed onto the conveyor. Then, you may want the conveyor to run for a certain amount of time, before the belts actually stop. Another example is a blower, which is blowing a product through a pipe. After you shut off the product feed into the line, the blower can run for a certain amount of time to blow the line clear. By default, the T4 data file is where the status of our timers are stored. Think of this as a work space for timers to be able to operate. If you open the T4 Data Table, you can just go to “Properties” to add up to 255 timers in this file. If you need more than 255 timers, you can simply create another timer data table, such as T9. The “Usage” button in the data table will show you what timers are already in use. In this example, we will use T4:1. Here is an example of how a TOF Instruction might be used in logic. Here we have an example of a motor with an external blower motor. The external blower motor will keep the main motor cool while it’s running, and for 15 seconds after it has been shut off. When we energize the switch (I:1/1), both the EN (Enable) and DN (Done) bit goes true right away. When the Main Switch is shut off, the Main Motor will shut off. This is on the EN (Enable Bit). 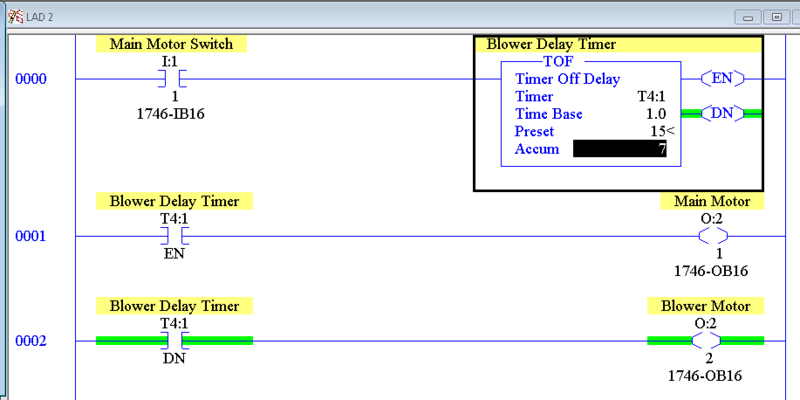 The timer will begin to time, The DN (Done) Bit is still on. 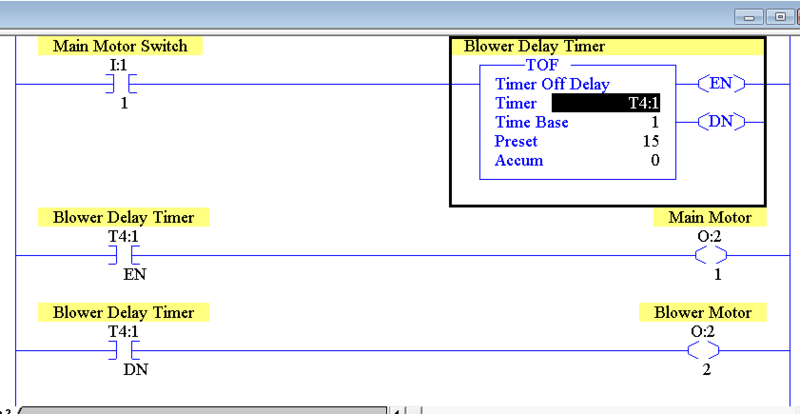 After the timer times out, then DN (Done) bit shuts off, and the accumulated value remains at the preset until the TOF instruction is energized again. 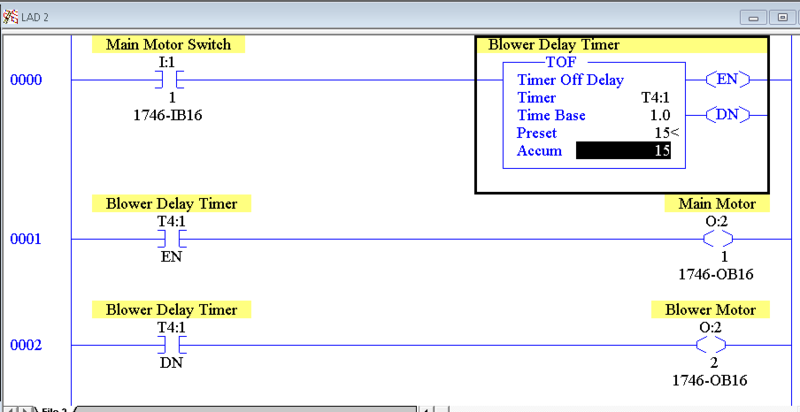 When the Timer Off Delay instruction goes true, the DN and EN go true right away. When the TOF goes false, the DN bit shuts off later (after the accumulated value reaches the preset. For more information on the SLC 500, Visit the SLC 500 Category page.